The Maryland Psychologist (TMP) is the official publication of the Maryland Psychological Association and is published quarterly (4 times per year). 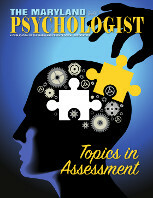 This publication focuses on research, practice, and issues facing the field of psychology. The Maryland Psychologist reaches over 1,200 psychologists throughout Maryland and beyond. Each issues covers important MPA and legislative news, book reviews, substantive articles in line with the issue's theme, and classified ads. MPA members receive 4 issues of The Maryland Psychologist per year and have online access to archived abstracts and full-text articles. Members can view and retrieve past issues of the TMP, but must be logged in to do so. Institutional/Corporate subscriptions available. Advertising opportunities are available. We accept text ads and display ads, with discounts for placement in multiple issues. See our advertising page for more details. Rebecca Resnik, Psy.D. and R. Patrick Savage, Ph.D. Therapeutic Relationship: Necessary and Sufficient? Members: Log in to access this issue & the most recent issue. The InPSYder is MPA's e-newsletter sent to members monthly, in the last week of each month. It contains timely news updates, member opportunities, and handy tips and resources for psychologists. The InPSYder is archived in the members section. Advertising is available.